One of the last remaining obstacles to its acquisition was removed last month, but one big hurdle remains. 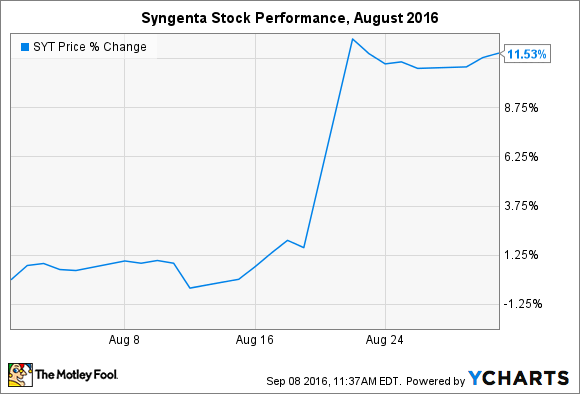 Shares of Swiss agrochemical company Syngenta (NYSE:SYT) rose 11.5% last month after the Committee on Foreign Investment in the United States (or CFIUS) cleared the way for its previously agreed-to $43 billion acquisition by ChemChina. It may seem odd that a merger-acquisition between a Chinese company and a Swiss company needs to get any approval whatsoever from a panel in the United States, but Syngenta's presence in the lower 48 allows CFIUS to reject takeovers -- or erect serious obstacles to them -- in the name of national security. Investors were nervous over the decision, especially considering CFIUS had recently rejected much smaller deals involving Chinese electronics companies. As such, prior to the announcement, Syngenta was trading at a market cap of just $37 billion -- 16% lower than the acquisition price. Its market cap shot up to about $41 billion after the announcement. It's worth noting that CFIUS has never raised objections to a deal in the food or agricultural sector, apparently taking the stance that America has an ample supply of food. While nothing ominous stands out about the Syngenta-ChemChina deal, investors shouldn't get comfortable with the panel's historical voting record within the industry: Natural security is in fact an integral part of national security. For current investors, however, the United States no longer poses a threat to the acquisition. The same cannot be said for Europe, which is still mulling over the implications of the proposed acquisition. The good news is that ChemChina remains patient, and has once again extended its deadline for the offer. It expects to close the acquisition by the end of 2016. Investors have to be happy about recent events. Now, regulators in the European Union pose the last remaining obstacle before the acquisition can be completed -- and they may be a little more unpredictable than you think. Luckily for investors, this is pretty simple. If you own shares, then you should take no action and patiently wait for the acquisition to close, whether that occurs as planned at the end of this year or after other potential conditions are met. But if you're an investor without a position in Syngenta, then you should stay on the sidelines. Nearly all of the upside -- which is capped at $43 billion -- is already factored into shares.